Taken on Ben el Gabel, Hurghada. A small fish which grows up to 12 cm. Unlike many other cardinal fish this species is active by both day and night (others are only active at night). It lives from 3 m down to 40 m in the Red Sea and elsewhere in the Indo-Pacific. When threatened it shelters in sea urchins. Carnivorous, they have small, very sharp teeth for feeding on small crustaceans and fishes. 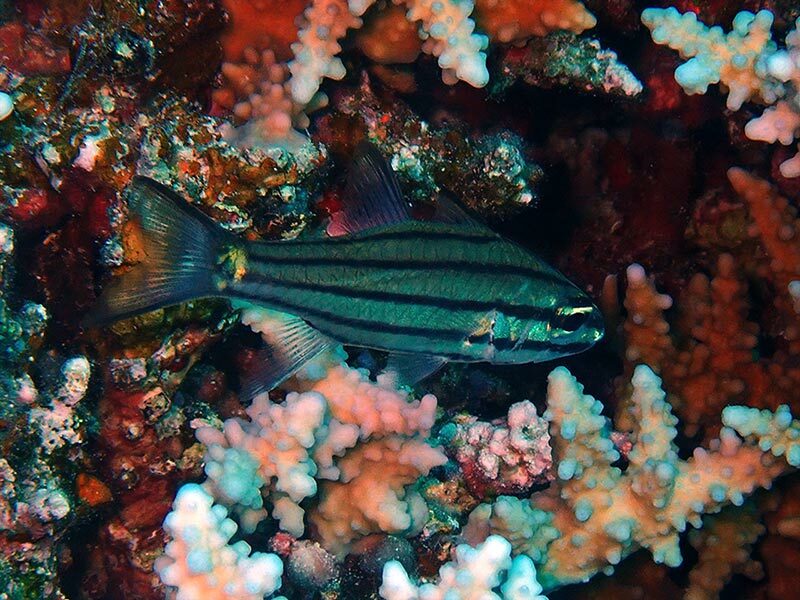 The male fiveline cardinalfish carries the eggs or larvae of its young in its mouth: mouth-brooding. It must go without food for quite some time when doing so. Every three minutes the fish will open its mouth and move the eggs to keep them aerated. So if you see a cardinal fish with a fat chin which may be holding eggs - keep your eye on it for a few minutes to be sure.